a greater sense of community and more empowered, self-responsible and happy learners. TCM: Classroom Practices that Lead Schools up the Pathway. 10 Reasons to Use TCM. TCM promotes a Psychology of Success in students, classrooms and schools. TCM leads a school up the School Effectiveness Roadmap. TCM moves your School up the Pathway. The ASSC School Climate Assessment Instruments (SCAI) have been rated “the Best” school climate surveys, and provides unique benefits. Because of its innovative design, sound theoretical framework and comprehensive content, the SCAI is capable of providing the most clear and usable information about the climate and function level at your school. The SCAI allows any school to locate itself on the school function and effectiveness "roadmap." 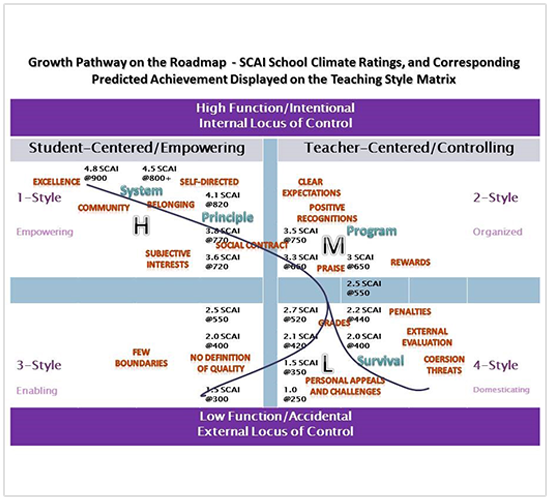 This roadmap (shown in the chart here) enables those at the school to see clearly where they are currently as well as what "moving up" would entail. The analytic structure provides the most reliable assessment of climate and function. You obtain the most accurate and usable data possible – as the cure is implied in the diagnosis with the SCAI. It is approved by the US DOE and has been used successfully in over 500 schools. 0.7 correlation with other key success indicators such as student achievement. Other surveys can’t match that it. Cross-referenceable versions for students, teachers and staff and parents, for both the elementary and secondary levels. All versions are available online or on paper. Items are grounded in the factors of "psychology of success" so the SCAI provides a clear window into the level of social and emotional learning, pedagogical quality, school culture, and the operating mindset. Integrates with the strategies in TCM. TCM provides pre-service teachers the principles and practices to conceive and produce excellence. It outlines the hows and whys novice teachers need to know to hit the ground running, as well as supporting their understanding of what it means to create the high functioning classroom and their students social and emotional well-being defined by a psychology of success. TCM is a complete treatment of classroom management and discipline so it works as a stand-alone and complete course or professional development resources. TCM provides new teachers the confidence of having the go-to resource they need to begin their growth as a teacher with high functioning principles and practical strategies to be effective right away. TCM helps new teachers keep their eyes on a vision of the excellent classroom and provides concrete and practical explanations for how to actualize that vision. As a result, they are able to achieve high function very early and without suppressing their humanity or joy (so they do not have to, as the saying goes, wait until the end of the first term to smile). TCM provides teachers of any experience level ideas to move to the next level of performance. It also helps the experienced teacher better classify their current strategies and habits into things they will want to 1) do more of, 2) modify, or 3) cease doing. The TCM teacher style matrix is helpful for any teacher to self-assess their basic intentions and how they might reconceive their goals as a classroom manager. 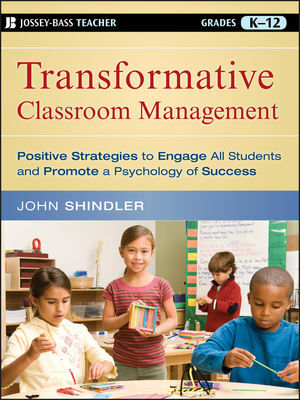 And many of the chapters provide step by step strategies that no other resource provides including Chapter 15 that gives teachers a systematic plan for creating the student-centered, community classroom. TCM outlines the practices and principles for how to create classrooms that support the overall schools movement to the next level. Combined with the ASSC pathway, TCM lays out a roadmap to a clearer understanding of what good looks like. The fact is that many popular classroom strategies at best contribute to mediocre functioning, and can actually contribute to school-wide dysfunction. TCM promotes only healthy long-term success psychology promoting practices. For schools that are already good, TCM outlines how to move from the common practices that define schools that are stuck at adequate and help them move to excellent. When TCM practices were used in schools consistently, the achievement in those schools represented over a 90tile level of academic performance and level of school climate. What is a Transformative Mindset? A transformative mindset is simply an intention to do away with the self-limiting references (values, narratives, beliefs, conditioning, etc.) that we are using currently and then opening ourselves to discovering more of the potential within us, our colleagues and our students, and then finding and applying the actions and practices that are most likely to make that happen. The Paragon Learning Style Inventory (PLSI) is a self-administered survey that provides a very reliable indication of learning style and cognitive preference. It uses the four Jungian dimensions (i.e, introversion/ extroversion, intuition/sensation, thinking/feeling, and judging/perceiving) that are also used by the Myers-Briggs Type Indicator, Murphy Meisgeir Type Indicator, and the Keirsey-Bates Temperament Sorter. But this is the only instrument that can be self-scored and works with ages 9-adult. © 2018, Transformative Classroom Management. All Rights Reserved.